Although the results for 2012 have yet to be finalized, it is known that last year Russia over-fulfilled its planned supply of arms and military equipment abroad by almost 12%. In the list of countries that signed export contracts, one of the top positions is occupied by India. Overall, the past decade has been characterized by steady growth in Russian arms exports. An impressively large proportion, particularly in the field of aviation, has gone to India. "This past year, Rosoboronexport signed contracts with India worth over $3.5 billion," stated Viktor Komardin, before leaving Moscow to head the company's delegation at the opening of the 9th "Aero India-2013" International Aerospace Exhibition on February 6 in Bangalore, India. He said that the lion's share of contracts with India were for Russian helicopters and related hardware. Rosoboronexport believes that the Ka-226T helicopter has particularly good prospects of breaking into the Indian market. According to official information provided by representatives of the holding company Russian Helicopters, "At the exhibition, the company will demonstrate its new range of light and medium multi-purpose helicopters, in particular the Ka-226T and the Mi-171A2, which over the next few years could become the main Russian products in India's increasingly active helicopter market. The light Ka-226T with a unique coaxial system of articulated rotors will take part in a tender for the supply of a large consignment of surveillance and reconnaissance helicopters for the Indian Air Force, and stands a very good chance of winning. In December 2012 in New Delhi, Russian Helicopters and Elcom Systems signed an agreement to create a joint venture to assemble Russian helicopters in India, including the Ka-226T. Another interesting innovation at the exhibition in Bangalore will be the modernized medium Mi-171A2, which incorporates the best features of its legendary predecessors, the Mi-8/17 and modifications, supplemented by the very latest technology. Today, India's fleet contains more than 200 Russian-made Mi-8/17 helicopters, and the need for this type of helicopter is still strong." Viktor Komardin noted that a final decision on the Ka-226T would be announced in June this year. In addition to helicopters, Moscow is also tendering to supply the IL-78MK90 aerial refueling tanker to India. But it has a serious competitor: Europe's Airbus-330 MRTT. "At present," remarks Komardin, "there are two contenders in the race: the Airbus-330 MRTT made by EADS and Russia's Il-78MK-90." According to him, the four-engined Il-78MK-90 and the twin-engined Airbus-330, having passed the rigorous technical evaluation and complex flight tests conducted by the Indian Air Force, both meet the requirements of the tender. When, in November last year, the envelopes containing the commercial bids were unsealed, the cost of the Il-78MK-90 turned out to be lower. That is a significant competitive advantage, notes Komardin. "Also in our favor is the fact that the Indian Air Force has successfully operated six Russian IL-78 aircraft, which it purchased in 2004," he added, explaining that the country already has the infrastructure in place to use Russian equipment, including trained crews and technical experts; moreover, Russian aircraft are easier to control. In view of the fact that India's armed forces are pressing for the deployment of a domestic aircraft carrier fleet, based on Russian hardware, it is logical that the country should purchase carrier-based aircraft from the same source. 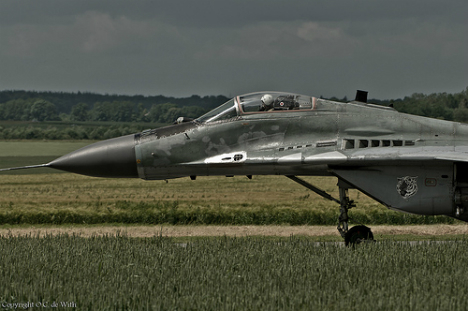 As such, according to the director of Russia's Federal Service for Military-Technical Cooperation, Alexander Fomin, before the end of the year Russia is to supply India with seven carrier-based MiG-29K fighters. "Under a contract signed in 2010 to supply an additional 29 MiG-29K shipborne aircraft, the first four units have already been exported. Seven more are due to be dispatched by end 2013," stated Fomin. One of the most prominent trends in the development of Russian military-technical exports is the country's shift from traditional sales to joint production, which is also to the benefit of third countries. "That keeps us a good half length ahead of the competition," believes Viktor Komardin.